Grab a seat ladies and gents, I'm about to become your favorite person ever. Oh, I'm about to fuel your already burning passion for purchasing all of the things at Target. If you're anything like me, the very first place you stop upon entering the Bulls Eye Wonderland is the Dollar Aisle. In my store, it's a cute little nook that requires a bit of jostling to ensure that our giant cart can make the turns but that doesn't deter me from charging through, in search of the best buys in Target. I'm here to tell you that despite most of the items being insane impulse buys, you can actually purchase reasonable and useful items at a great price point in in the Dollar Aisle. Gift bags can be so darn expensive! And let's be real, you use them once and then they get passed around from person to person as they are re-used. I have a tough time swallowing a big price on a tiny gift bag (no matter how cute) so I always grab generic gift bags from the Dollar Aisle when I spot them. I make sure to grab a medium size and a theme that can go anywhere and consider it a dollar well spent. As a bonus, you can often find a pack of 5 small craft gift bags for $3 in the Dollar Aisle, which breaks down to be cheaper than the generic bags available in the wrapping section (which are usually just under $1 a piece). I snag those in black or the traditional brown craft paper when I see them. For a dollar, you cannot go wrong with patterned, bubble lined mailing envelopes. Because they are so cute, I used them instead of wrapping a present, finding a box, labeling the box and shipping. Instead, I use cute tissue and ribbon to wrap the gift, pop it and a card right into the bubble mailer and send it on it's way. Sometimes, you can also find the large, soft, white mailing envelopes in the Dollar Aisle and they are for sure worth a snag - they are usually on the bottom shelf (because they aren't cute) and are perfect for mailing bulky items like hand me down clothes or oddly shaped items. Ok, I do not understand why greeting cards are so expensive. Cards are wonderful and choosing just the perfect one is sweet but flipping over a card and seeing a $5 price tag is just not cool. The Dollar Aisle often has really cute greeting cards and envelopes for all occasions - I make sure to grab a handful of generic Happy Birthday, Welcome Baby and Wedding cards when I see them. Usually, the inside is blank and I can keep on hand to personalize and drop in the mail/add to a gift without having to make a special run for a card. I also love, love, love the note card packs from the Dollar Aisle. You can usually find packs of 8 cards and envelopes for one dollar. I keep a pack in my car (for notes to teachers, quick thank you's to work associates, etc), a few in my kitchen junk drawer and a pack in my desk. I can't tell you how many times I've been glad to have them on hand (most recently when I needed to contribute cash to the End Of The Year Gift and needed to leave money in a toddler cubby for the mom in charge). Especially if you are a fan of a styled social media style desk, you should never pass up a chance to raid the Dollar Aisle office supplies. Cute to-do list pads, magnetic note pads, multicolored paperclips and push pins and on trend-colors are guarantees in the Dollar Aisle. I can't help but buy all of the storage things - and thankfully, I feel like there is always chaos to be controlled in my home. I recently snagged the white wire baskets (note: they are $3, so on the pricier end of the Dollar Aisle spectrum) for the open shelves in our playroom storage chest. They are the perfect size to slide pretty much anywhere - in the baby's chest of drawers to organize clothes, in kitchen cabinets to hold snack bags and pouches or in a closet to wrangle toddler shoes. and wooden utensils that shred and splinter. Yep, I couldn't resist the call of the dollar price tag, but I so should have. 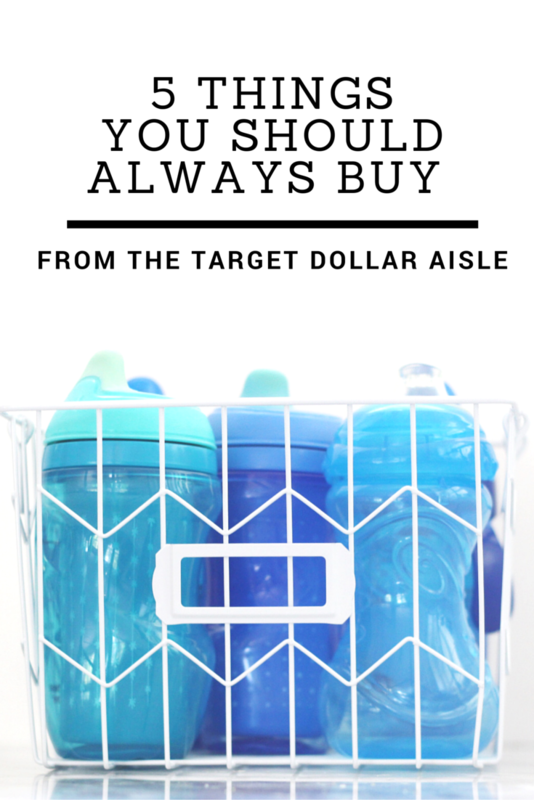 What are you go-to Dollar Aisle items?? Just got their gift bags for the first time and I'm in love! Love their note cards too! I got my son gardening gloves and apron and it was totally worth it! The best part of my favorite store! I go in for laundry soap and leave with $50 worth of note cards, office supplies, decorative stuff for the holidays, it's so great. Glad to know I'm not alone in my dollar section obsession. I bought some gift bags last month and I will absolutely be doing that again. They are so much cheaper than the other options at Target. I also love that they almost always have Star Wars stuff. I bought my husband two pairs of Star Wars socks for his Christmas stocking and he wears them constantly. Chalk markers and mason jars are some of my favorite Dollar Spot finds! I also love the labels, and kids' summer toys are the best from there! Oh - and little planters. I may have a small love affair with the Dollar Spot. The cute office supplies gets me every time!! Laughing so hard about the plastic garden gnome. I think we could be best friends because I am like "why did she...", but at the same time I totally would have too.